Most of us are familiar with or have at least heard of the concept of microservices, this year at Open World I also heard the term microsites more and more and I went on an investigation to find out more about the possibilities. I was surprised to find out I got more and more enthusiastic about this concept and the possibilities with the Oracle Cloud. Microsites is a concept for a small temporary site. You can think of example like a page for a market campaign, an event, a product launch, etc. 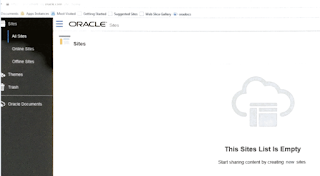 Oracle offers this with the help of two cloud services the Document Cloud Service (DCS) and the Sites Cloud Service (SCS). The DocumentCloud Service is already live and ready to use, this is a tool to help you collaborate and share documents with others. It has a lot of out of the box functionalities, a mobile application and you can even get your content offline, for example to work on your ipad when disconnected. In the concept of microsites you put all your web content, documents, images, etc in one or more folders on your machine. Use the sync master tool to synchronize these folders back to the document cloud. The DCS assets can then be used by the Sites Cloud Service. Oracle Sites Cloud Service will be coming soon, this is in terms of a couple of weeks. The documentation of SCS is already up and running, so you can check it out. 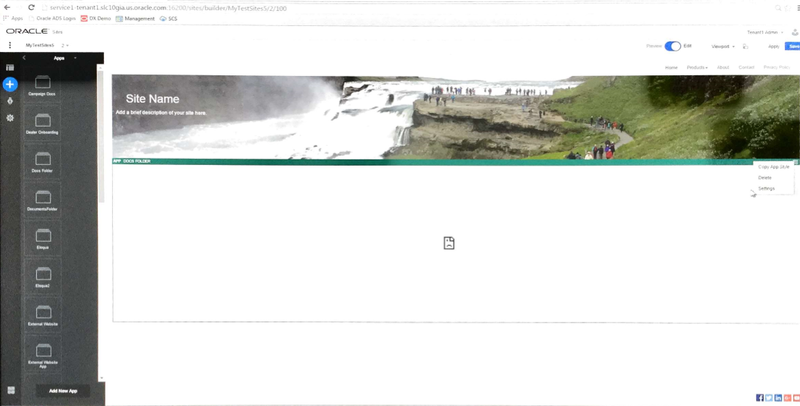 Within SCS you have a WYSIWYG editor to create sites. The product is shipped with a few standard themes, but you can create your own or use an existing bootstrap theme to help you set up the basics for the site. The layout management of the site is not done by the theme, but in the edit modus of the site. After this you can drag and drop out of the box components to create your website, add images/galleries, youtube videos, documents/folders and more. You can access any content in DCS and drag & drop it on the site. You can rearrange component on the page any way you like. When you start editing you create an ‘update session’ in which you make several changes, this features helps with creating several changes and publish (or schedule) them as one batch to the live website. You can even work separated on different batches in different parts of the microsite. One of the most heard questions is what is the different from Oracle JET with Oracle ADF? Will the one replace the other? Or will they coexist next to each other? All very valid questions, for now they will coexist next to each other. Oracle supports and invests in both products, focusing on a different kind of developer and a different kind of tool. 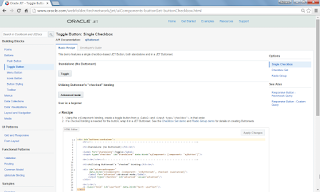 You can see this in their own product as well, as a rule of thumb Oracle builds their SaaS application with the ADF and their PaaS applications with JET. They share a lot of the same components and the Oracle DVT components work also in JET, this means the same DVT components work in Oracle ADF, MAF & JET. JET is based on libraries such as JQuery, JQuery UI & KnockOut, therefore you can use the key features (like 2 way binding) out of these libraries in JET as well. Behind the scenes Oracle has worked on this project for over 2 years, with the same development teams as the teams that work on ADF Faces & DVT’s. JET is a modular toolkit in which you can pick ‘n mix your own JS libraries to extend more capabilities. Oracle has also build in support for internationalization & accessibility. For now the use of Oracle JET is only for “the lucky few”, it comes with a Restrictive Use License (RUL) if you are using one of the few Cloud products (MCS, JCS, DevCS, ABCS: more on these in later blogs) Oracle offers today. However, they are looking for open source possibilities under the Apache 2.0 license. That they are working on open sourcing, but they did not give a timeframe on this yet. The release cycle of JET will be aimed at a minor release every two months and a major release every six. You can use any code editor you prefer, whether this is Agnostic, NetBeans or some other IDE. They do however have build in support in the latest release of NetBeans, so it might be wise to let that be your weapon of choice. 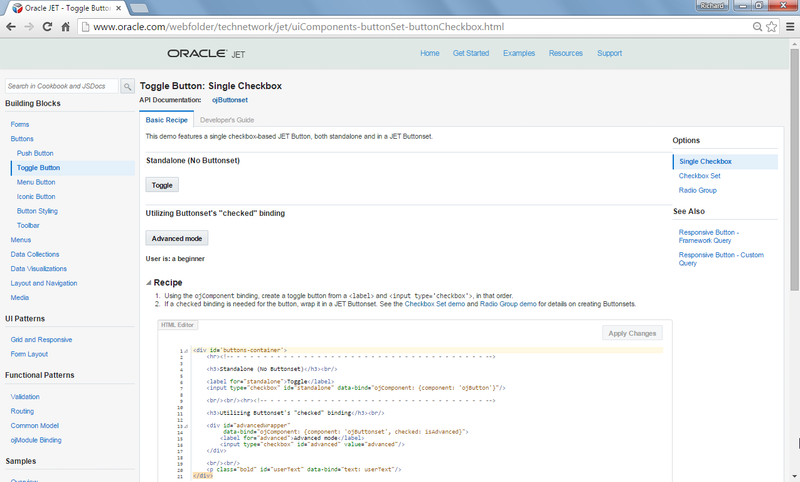 Last but not least, Oracle Application Builder Cloud Services (ABCS) is fully build in Oracle JET, but it also produces Oracle JET code. So when you use the ABCS to create user interfaces, you can get the underlying JET code and continue working on that as a developer.